Jerome Powell's goal since he became Chairman of the Federal Reserve has been to keep a low profile and rebuild trust and confidence in the U.S. central bank — among lawmakers and the public. He's sought to win friends on Capitol Hill, taking seemingly as many meetings with lawmakers in his first months on the job as former Chair Janet Yellen did in four years, and he's upped the number of Federal Reserve press conferences and made a point to speak more plainly. Why it matters: Though his goal has been to make the public think that the economic data is steering the economy rather than the Fed, he's done just the opposite. Thanks to his pronouncement on Friday that the Fed would be "patient" with future interest rate hikes and ready to change course “significantly if necessary," — a reversal of his previous stay-the-course message after the Fed raised U.S. interest rates in December — Powell has lost credibility in the eyes of many market watchers. "The Fed is backing down as we expected. This is the policy mistake we awaited," said Yves Lamoureux, president of behavioral research firm Lamoureux&Co., who predicted both the February equity market peak and December swoon in 2018. "Stocks get hammered next week." "I am flummoxed by this man I once had faith in," said Danielle DiMartino Booth, a former advisor to Dallas Fed President Richard Fisher and current CEO of Quill Intelligence. Powell certainly had help getting into this precarious situation — he's had to dodge a fight with President Trump at every turn and negotiate a monetary tightening cycle amid a stock market that has been its most volatile in years and that last year delivered its worst performance since the financial crisis. Bottom line: Powell's attempts to please everyone predictably have gone awry. The market will be fully on edge and ready to dissect his every word as he speaks on Thursday at the Economic Club of Washington, which is exactly what he didn't want. Flashback: Remember two days ago when we wrote that "No one believes the Fed." What's next: Minutes from the Fed's Dec. 18-19 policy meeting are due out at 2 p.m. today. Powell's Friday comments may have erased the memory of that meeting, but the market will still peruse it for details. 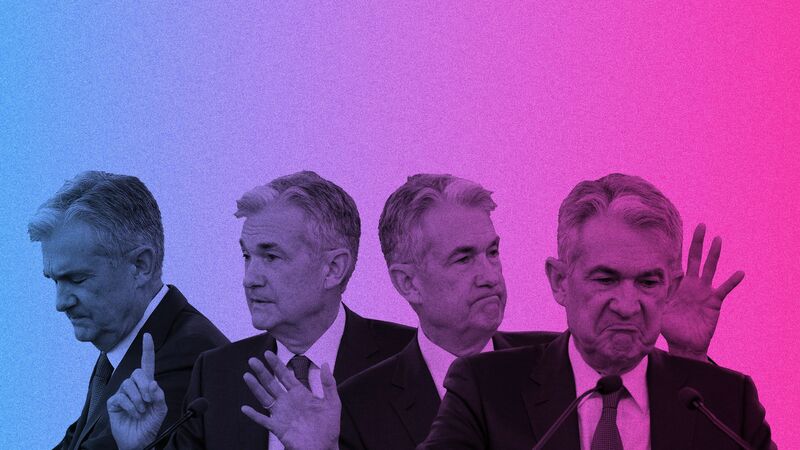 "My general rule is this: The Fed will choose recession over inflation, but as long as inflation looks to hold sustainably near the Fed’s target, there will be a 'Powell put' on the economy. That’s something to remember when wrestling with the recession calls that have grown louder in recent months. If you aren’t recognizing that absent inflation the Fed has the ability and willingness to cushion the economy against shocks that could threaten to send growth sharply lower than expected, you are doing it wrong." — Tim Duy, professor of economics, University of Oregon. Barclays became the latest Wall Street firm to lower its 2019 year-end price target for the S&P 500, dropping it to 2,750 from 3,000 on Tuesday. Six firms have moved their guidance lower just eight days into the year. Barclays cited retail sentiment that has turned "significantly bearish," and an economic growth outlook outside the U.S. that was "not as constructive." Yes, but: Despite the pullback, Barclays analysts did note that they still expected U.S. equities to rise overall by the end of the year. No major firm so far has revised its outlook into negative territory. The World Bank forecast slowing growth for the world in 2019 of 2.9%, down slightly, from the 3% growth in 2018, per its latest update to the semi-annual Global Economic Prospects report. World Bank officials highlighted the trade war between the U.S. and China in announcing the lowered expectations. Growth in the U.S. is likely to slow to 2.5% this year while China is expected to grow at 6.2% in 2019 compared with 6.5% in 2018. "At the beginning of 2018 the global economy was firing on all cylinders, but it lost speed during the year and the ride could get even bumpier in the year ahead." The U.S. stock market has a habit of rallying out of big drops when the forward price to earnings ratio falls. "Over one-year periods, if the PE drops by at least 3 points, the subsequent average return is nearly 17%, with gains in eight out of nine observations. The S&P 500 currently meets this criterion even after Friday’s big rally, suggesting stocks can generate above-average returns in the coming year." As the Federal Reserve has continued to reduce its bond holdings and foreign buyers have lost their appetite, most U.S. Treasury bonds have largely gone to U.S. savers who now account for nearly 50% of those holding U.S. government debt. That's a major shift from 2014 when overseas central banks and foreign citizens owned nearly half of U.S. debt. The so-called savers are a mix of banks that are essentially obligated to buy Treasuries, large financial firms, businesses looking to store cash and everyday Americans who buy government bonds. 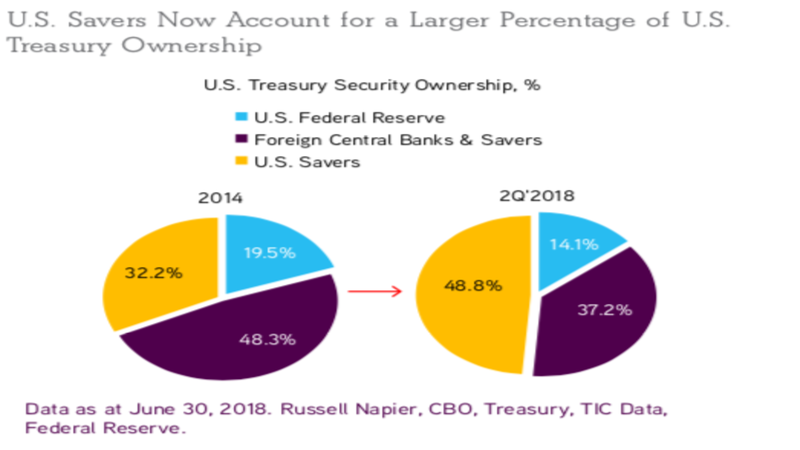 Why it matters: The U.S. Treasury unloaded its largest debt sales on record late last year and is poised to continue issuing debt at elevated levels as the United States approaches $22 trillion in sovereign debt. That more American savers than foreign nations and central banks own the U.S. debt, though, is very likely a good thing. A country's debt is more secure when its owned by its citizens rather than foreign powers. 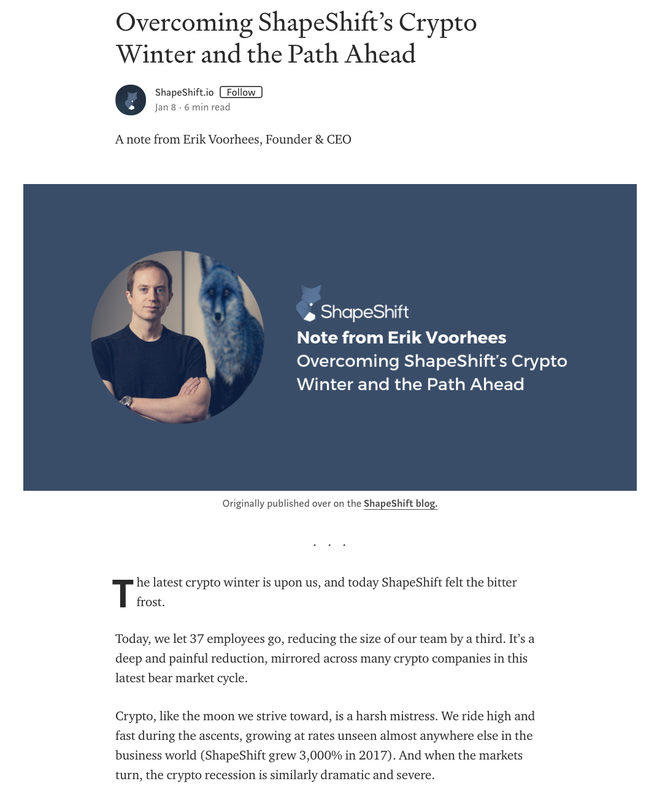 Erik Voorhees' ShapeShift.io digital currency exchange announced it was parting ways with 37 employees, or about a third of its workforce, Tuesday the company announced in a post on Medium. A screenshot of Voorhees' post on Medium. Voorhees took some poetic license in the post, likening the cryptocurrency market to winter, tumultuous seas, a frontier, a harsh mistress but also a "beautifully inclusive and empowering" utopia. He compared ShapeShift to a pirate ship with a plank, fabric and magic. The bottom line: The post also highlighted the toll the awful performance of cryptocurrencies in 2018 had on many of the businesses that thrived on it in 2017. The total value of all the world’s cryptocurrencies fell to around $130 billion at the end of 2018 from more than $600 billion at their peak a year earlier, according to a post from MIT Technology Review. Due to an editing error (thanks, @AxiosNick) yesterday's Axios Markets mistakenly called B-rated debt the lowest for investment grade when it's actually BBB-. He's sorry.